Know Your Count – keep track of the remaining doses! Asthma is a chronic disease of the lungs which causes breathing difficulty. The symptoms of the disease are shortness of breath or rapid breathing, chest tightness, wheezing, coughing, among others. In the United States alone approximately 25 million people are living with asthma. Just recently The Asthma and Allergy Foundation of America (AAFA) together with Teva Respiratory conducted a survey among 590 asthma patients. The survey revealed that half of them have had situations when they needed their rescue inhaler, yet, it was empty. Many people had had to go to emergency room while others had to go without treatment. “Each year, asthma attacks account for nearly two million emergency room visits in the U.S.,” said Mike Tringale, Senior Vice President at AAFA. Now AAFA together with Teva have launched a “Know Your Count” campaign that is addressing exactly this issue – urging patients with asthma to know the count of remaining doses in their rescue inhalers. To help promote the cause, also Kristin Chenoweth has joined the campaign as a spokesperson. “I have struggled with asthma for more than a decade and am excited to be part of the Know Your Count campaign” said Kristin Chenoweth, Know Your Count spokesperson. “As a singer and actress, my schedule can be quite hectic at times and I simply can’t afford to let my asthma symptoms slow me down. To ensure I’m prepared in the event of an asthma attack, I count on my rescue inhaler with a dose counter to help me keep track of my remaining doses. It is my hope that by sharing my personal experience, I can encourage patients to know their count when it comes to asthma management,” she said. You are invited to learn more about the campaign and asthma safety at www.KnowYourCount.com. Disclosure: This post was requested by an advertiser. This entry was posted in General Health and tagged asthma, breath, chest problem, Lungs on March 17, 2014 by Dr.Sobia Adnan. Necrotizing soft tissue infection is a severe and very rare type of bacterial infection which destroys the muscles, skin, and underlying tissue. The word “necrotizing” means something that causes body tissue to die. Necrotizing fasciitis is a rapidly spreading infection, usually located in fascial planes of connective tissue that results in tissue death (necrosis). ). Fascial planes are bands of connective tissue that surround muscles, nerves, and blood vessels. Fascial planes can bind structures together as well as allow body structures to slide over each other effectively. Different types of bacterial infection can cause necrotizing fasciitis. Necrotizing Fascitis is mainly caused by group A beta-hemolytic streptococci (Streptococcus pyogenes), most investigators now agree that many different bacterial genera and species, either alone or together (polymicrobial), can cause this disease. Occasionally, mycotic (fungal) species cause necrotizing fasciitis. The majority of cases begin with an existing infection or a wound most frequently on an extremity. It can occur in almost any area of the body. Necrotizing fasciitis is a serious condition that is often associated with sepsis and extensive organ failure. Treatment involves antibiotics and surgical debridement of the wound areas as well as supportive measures such as insertion of a breathing tube, intravenous administration of fluids, and drugs to support the cardiovascular system. Currently, there are many names that have been used for necrotizing fasciitis:flesh-eating bacterial infection or disease; suppurative fasciitis; dermal, Meleney, hospital, or Fournier’s gangrene; and necrotizing cellulitis. 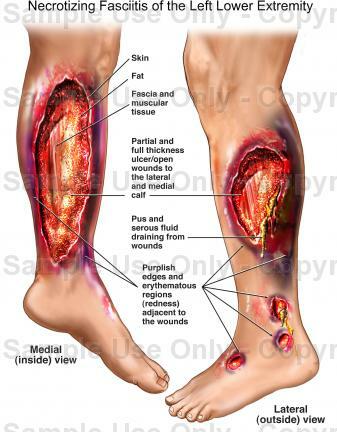 This entry was posted in Infections and tagged cellultis Necrotizing Fasciitis, Fasciitis – necrotizing, flesh eating, flesh eating disease, Flesh-eating bacteria, fourniers gangrene, Gangrene - soft tissue, how is Necrotizing fasciitis diagnosed, infections, mrsa Necrotizing Fasciitis, Necrotizing fasciitis, Necrotizing fasciitis causes, Necrotizing fasciitis contagious, Necrotizing fasciitis diagnosis, Necrotizing fasciitis photos, Necrotizing fasciitis pictures, Necrotizing fasciitis risks, Necrotizing fasciitis signs, Necrotizing fasciitis statistics, Necrotizing fasciitis symptoms, Necrotizing fasciitis tests, Necrotizing fasciitis transmission, Necrotizing fasciitis treatment, nectrotizing enterocolitis, Soft tissue gangrene, treatment Necrotizing Fasciitis, Vibrio vulnificus infection, what are the causes of Necrotizing fasciitis, what are the signs of Necrotizing fasciitis, what are the symptoms of Necrotizing fasciitis, what are the tests for Necrotizing fasciitis, what is nectrozing fasciitis, who are at risk of Necrotizing fasciitis on March 17, 2014 by Dr.Sobia Adnan. Surgery is needed to treat melanoma. The skin cancer and some surrounding tissue will be removed. How much skin is removed depends on how deep the melanoma has grown. If the cancer has spread to close by lymph nodes, these lymph nodes may also be removed. After surgery, interferons are given. Chemotherapy: Medicines are used to kill cancer cells. these usually given if the melanoma has returned or spread. Immunotherapy: Medications such as interferon or interleukin help your immune system fight the cancer. They may used along with chemotherapy and surgery. Radiation treatments: These are used to relieve pain or discomfort caused by cancer that has spread. Surgery: Surgery is done to remove cancer that has spread to other parts of the body. This is done to relieve pain or discomfort associated with the growing cancer. Early-stage melanoma can usually be treated with surgery alone. Surgery is the first treatment for all stages of melanoma (IA through IV). The tumor is removed entirely, along with some surrounding tissue (about ¾ of an inch all around). The surgery may be done by a dermatologist or a surgeon, and it sometimes happens as part of the diagnosis process. In some cases, a skin graft may be needed to replace skin that has been removed. If the melanoma has spread to the nearby lymph nodes, the affected lymph nodes are also removed surgically. Surgery is usually the only treatment needed for people with early-stage melanomas (thinner melanomas that have not spread to the lymph nodes). However, these patients need regular follow-up visits to the doctor, to make sure the melanoma has not returned and that other moles do not need biopsies. Once a person has had melanoma, there is a higher chance of getting it again. Melanoma that has spread to distant sites in the body or to other organs (such as the lungs or liver) is known as Stage IV. For these patients, treatment options may be available, including clinical trials. Please discuss your options with your health care professional. How well a patient does depends how quickly the cancer was diagnosed and how far it has spread. If caught early, some melanomas can be cured. Melanoma that is very deep or has spread to the lymph nodes is more likely to return after treatment. If it is deeper than 4 mm or has spread to the lymph nodes, you are more likely to have the cancer spread to other tissues and organs. Melanoma usually cannot be cured when the cancer has spread beyond the skin and nearby lymph nodes. If you have had melanoma and recovered, it is very important to examine your body regularly for any unusual changes. Your risk for melanoma is increased once you have had this cancer. Melanoma may return years later. Melanoma can spread to other parts of the body very quickly. Melanoma treatment can cause side effects, including pain, nausea, and fatigue. The American Cancer Society recommends professional skin examinations every year for people older than 40, and every 3 years for people ages 20 – 40. You should also examine your skin once a month, using a mirror to check hard-to-see places. Call your doctor if you notice any changes. The best way to prevent skin cancer is to reduce your exposure to sunlight. Ultraviolet light is most intense between 10 a.m. and 4 p.m., so try to avoid sun exposure during these hours. Protect the skin by wearing hats, long-sleeved shirts, long skirts, or pants. Apply high-quality sunscreens with sun protection factor (SPF) ratings of at least 15, even when you are only going outdoors for a short time. Apply a large amount of sunscreen on all exposed areas, including ears and feet. Use sunscreens that block both UVA and UVB light. Apply sunscreen at least 30 minutes before going outside, and reapply it frequently, especially after swimming. Use sunscreen in winter, too. Protect yourself even on cloudy days. Avoid surfaces that reflect light more, such as water, sand, concrete, and white-painted areas. The dangers are greater closer to the start of summer. Skin burns faster at higher altitudes. If you are interested in learning more about the treatment and prevention of melanoma and any other health related issues. Perhaps a nursing degree online might interest you. Click here to see an example of the programs that are available. This entry was posted in Cancer and tagged 5 year survival of melanoma, can we prevent melanoma, Cancer Cells, Chemotherapy, Dermatologist, Diagnosis, General Health, how can melonama be prevented, Immune System, Interferon, interferons, Interleukin, Medicines, Melan, melanoma, melanoma cancer, melanoma causes, melanoma maligno, melanoma moles, melanoma prevention, melanoma skin cancer, melanoma treatment, melanoma types, multiple melanoma, Nearby Lymph Nodes, Organs, pictures of melanoma, Radiation Treatments, skin cancer, Skin Graft, skin melanoma, treatment of melanoma, treatments for melanoma, Tumor, what causes melanoma, what is melanoma on March 16, 2014 by Dr.Sobia Adnan. Head lice is a common phenomenon among school-aged children. This is according to a national survey carried out recently on behalf of Sanofi Pasteur, which also revealed that most moms are very ignorant of the whole occurrence. This has led to many question marks on pediatricians who would like to educate these young women about head lice. The study, conducted by Harris Poll, also concluded how moms feel frustrated when one of their own is infested by lice. This is because they have no sure knowledge of how they can deal with it or prevent it from spreading. However, CDC has let out some guidelines to advise and educate them about it. They have advised home fumigation, laundering of linens using hot water and avoiding insecticide sprays. A promising treatment option for moms to consider, approved by the U.S. Food and Drug Administration (FDA) in February 2012, is the Sklice treatment option (Lotion, 0.5%, learn more at www.Sklice.com). This entry was posted in General Health and tagged hair lice, head lice, head lice treatment, lice on March 8, 2014 by Dr.Sobia Adnan. Hepatitis B is an infectious hepatitis caused by the hepatitis B virus (HBV). This infection has two phases; acute phase and chronic phase. Acute hepatitis B refers to newly acquired infections. Affected individuals experience symptoms approximately 1 to 4 months after exposure to the virus. This is the incubation period of hepatitis B. In most people with acute hepatitis, symptoms resolve over weeks to months and they are cured of the infection. However, a small number of people develop a very severe, life-threatening form of acute hepatitis called fulminant hepatitis. Chronic hepatitis B is an infection with HBV that lasts longer than 6 months. Once the infection becomes chronic, it never goes away completely. Approximately 90% to 95% of infected adults are able to fight off the virus so their infection is cured. Only about 5% to 10% of adults infected with HBV go on to develop chronic infection. Children are at much higher risk for chronic infection than adults. Up to 90% of infected young children will fail to clear the virus from their bodies and go on to develop chronic infection. This entry was posted in Hepatitis, Infections and tagged 4 Months, Acute Hepatitis, Acute Phase, Chronic Carriers, Chronic Hbv Infection, Chronic Hepatitis, Chronic Infection, Chronic Phase, Disease Of The Liver, Experience Symptoms, Fight Infections, hep b, Hepatitis, hepatitis b, hepatitis b virus, Hepatitis Symptoms, Hepatitis Virus, how common is hepatitis b?, Incubation Period Of Hepatitis B, Infectious Hepatitis, Permanent Damage, Term Inflammation, what is hepatitis b, what is hepatitis b virus on March 8, 2014 by Dr.Sobia Adnan.